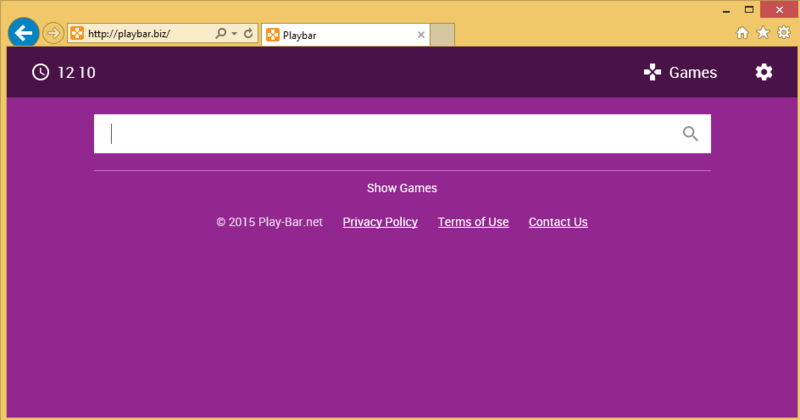 Play-bar.biz is classified as a browser hijacker, because it can alter your browser settings such as your default search provider and home page. The hijacker changes these settings as soon as it enters your system, which usually happens after you install freeware or shareware. There is nothing particularly useful about the unwanted program, and keeping it installed is not something we would recommend, In addition to modifying your settings, the hijacker will also flood you with advertisements and redirect you to unknown sites. We suggest that you get rid of Play-bar.biz without hesitation. The hijacker switches your home page and default search provider to Play-bar.biz. This webpage shows you local time and weather. It also contains a search box and links to online games. The search box redirects you to Google.com. You can use Google Search directly without having to deal with the hijacker. It may seem like Play-bar.biz is a reliable page with useful features, however, its main purpose is to promote advertising content. You may be exposed to unreliable ads and links that could lead you to corrupted pages. You may also get redirected to unknown websites in the middle of your browsing for no reason. If you do not want to risk your computer’s safety, we suggest that you terminate Play-bar.biz. The hijacker gets distributed via free third party software. It usually spreads together with other potentially unwanted programs. If you wish to avoid such programs in the future, you should be more attentive during freeware installation. If you choose advanced mode and decline all additional offers, you should be able to avoid browser hijackers and other disruptive applications. There are two ways you can eliminate Play-bar.biz from your browsers: manually or automatically. Manual Play-bar.biz removal is not too complicated. In order to complete it, you will have to uninstall the hijacker’s associated application and restore your browser settings. The removal guide below will help you with both of these tasks. If, however, you decide to delete Play-bar.biz automatically, you should download the anti-malware tool WiperSoft from our page and use it to scan your system. Once the scan is complete, you will be able to remove Play-bar.biz along with its associated program and other potential threats. The security utility will also provide you with reliable online protection against different types of Internet-based parasites including adware, spyware, Trojans, rootkits, and more.